Fugitive LT size M, the first 29er I own which can use the marketing claim "Does not feel like a 29er" to 100%. Well done. Last edited by Stefan0103; 6 Days Ago at 08:33 AM. Love that Blue, great looking rig! held back in some way on the rooty/rocky/climby terrain here. Not east coast but Austin, TX....the Fugitive is an incredible bike in the tech. Not too long and the four by suspension is a great way to go for rooty/ledgy climbing. I'm coming off and endorphin and this bike keeps blowing my mind. I have been back on my Fugitive instead of my hardtail for a few rides now and have some thoughts. At 5'9" on a large with a 40mm stem I feel the fit is very good. I am not stretched out at all while seated and the DHness is incredible with the decent wheelbase. With the X2/Grip2 combo I can't imagine suspension action being better. I'm going to demo the Forbidden Bike Company Druid soon, because our shop is going to carry them, but doubt if it can be better. I agree on the sizing, very glad I went with the large + 40mm stem at 5'10". I've added a second 10mm spacer under the stem but that's it. My only gripe (minor) is not specific to the Fugitive but has more to do with steep seat tube angles in general. Seated climbing is great and any time i'm riding with the saddle dropped is great. The common complaint I hear about steep STAs, added weight on the hands on flatter trails, is a non-issue. The only time I have an issue is when I'm riding out of the saddle with the saddle at full height. Think rolling terrain with lots of short ups and downs, quick climbs that you power through out of the saddle without gearing down. The seated and standing positions are so close that the nose of the saddle is in the way a little bit. Similar issue with jumping; the saddle has to be dropped at least partially or it's going to smack my rear end. I’ll try to provide some more feedback when I have more time on the 135, but even in the 120 setup, I have no regrets making the switch. The Riot is a solid bike, but I’m happy to be back on Knolly suspension. And now I can carry a full size water bottle (size XL). I’m looking forward to getting this frame up to the shed. Great place to put it through the ringer. Where are you located? I live in Frederick. Im on a Riot now, Avy coil so the rear isn't skippy . Cool. I’ll keep an eye out for you when we ride up there. I said the same thing about Knolly and a 29er, so I felt like I had to buy one...glad I did! At 5'9" the large seems like a lot of bike to me. Looking at the numbers, there is nothing about the large that would compel me to go that route, the medium seems nearly spot on. I'm curious what made you choose the large? 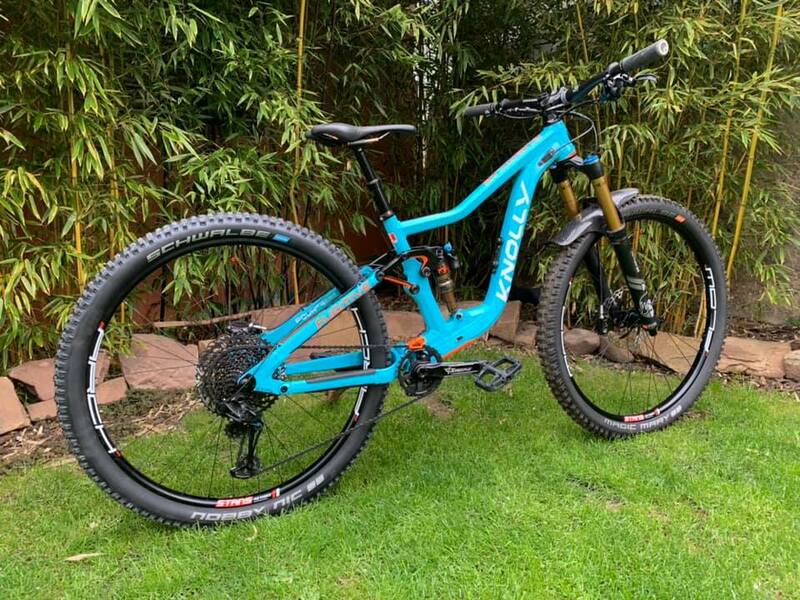 I went tried a medium Mondraker Vantage frame 3 years ago that has similar numbers to the large Fugitive and loved it. Then I went from medium Endo to large and picked up a Pipedream Moxie hardtail. Those bike felt far more natural than any old school medium ever did. Because of the Fugitives lower stack it fits smaller than my Moxie. I think we will eventually see medium bikes settle in around 470-480mm reach. Anybody have a recommendation on a travel bike bag that works well for the Fugy? What did some of you guys that just did Sedona use? Thanks! i'm looking to replace my kona process 111 frame with a knolly fugitive. I already have Knolly Warden that is built for bike parks, i need a bike that pedals well and that is fun on descending, a trail bike. So i will keep it at 120 mm of travel for the beginning. - If i want to convert it to LT later i just need to remove a spacer on the shock or need a new shock? Don't know new type of shocks and how they work. - where can i buy the frame? On the knolly website it says 500 USD for shipping to Italy!!! Any other website that sells it? In Europe i couldn't find anyone. 500us to ship a frame?! Forget it!! You're not that far from France so if shipping is too much you could still go there ride and buy the frame? Go on facebook ''Knolly bikes France''! I guess you didn't try hard enough?! :P Don't worry, the guy also speak english. 500us to ship a frame?! Forget it!! You're not that far from France so if shipping is too much you could still go there ride and buy the frame? Go on facebook ''Knolly bikes France''! I guess you didn't try hard enough?! Don't worry, the guy also speak english. Take a look at the RF143 spindle! That replies majority of my questions !! Evoc Pro. I have over 10 trips with mine, and have had zero issues. Best part is the removable front wheel. Makes a huge difference if your using public transpo to and from the airport. Right on, thanks! I was looking at the Evoc's and was hoping someone would confirm they fit. Just to be clear, I have not put a Fugitive in the bag (med Warden), but there is a fair bit of room left over. For 29 wheels, you’ll have to completely deflate the tires. Oh, gotcha. Thanks for sharing that. I'm not well versed on all of the variables...never done the fly with a bike thing before, and am trying to do math on bringing my own versus renting for an upcoming trip that isn't fully mtb focused. I've recently purchased a Biknd Jetpack v2 but haven't used it yet, I also looked at the Evoc pro which my friend just got but decided I didn't need the extra length. We're heading to Derby in a few weeks so get to test them then. Thanks guys! I appreciate the input all the way around. I have been toying with the idea of a -1° headset with my 150mm fork and the normal shock hole. Any thoughts? What's your reasoning over just putting it in slack mode? For the STA? Yes, I don't want to compromise the steeper STA and my saddle is already forward on the rails. After last nights ride, I'm not sure anymore, that bike is fast as is. Anyone have easy access to the weights of Fugative LTs with the different factory build options? Thanks. You can custom build a Fug on the Fanatik site. Might not be exactly the same as a factory kit, but you'll be able to get something close. I think it's a good idea, especially since you've upsized so keeping the STA steeper would be advantageous. I've been running an offset bushing on the Endo for a while now (about 0.6° slacker HA/STA) and just replaced it with a -1° angleset, so the STA is back where it should be and the front is about half a degree slacker than before. Positive change on both counts IMO, took about half a trail to adapt to. 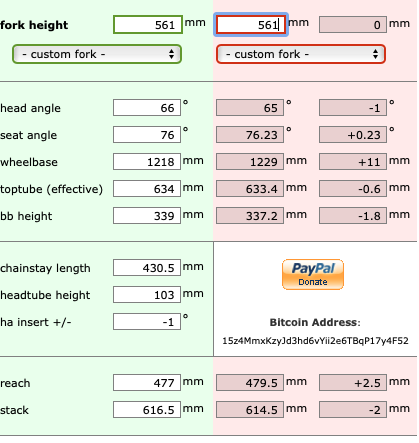 Only issue in your case might be the increase in stack height, or could you swap your bars out for flat ones to counter that? I'll be getting mine through grassroots if I spring for one so it will have to be one of their current builds. At least until I start changing things. pump track ideas or plans? Does anyone have plans to a decent set of ski bike plans?